LOGAN, UTAH, USA — About four years ago, Utah State University chemist Lisa Berreau posed a question to USU colleague and toxicologist Abby Benninghoff. "My students and I had developed a new flavonoid molecule that could release carbon monoxide," Berreau recalls. "And we were seeking an answer to the question, 'Could it kill cancer cells?'" Benninghoff's short answer? Yes. But as in many scientific pursuits, the question raised more questions and initiated an interdisciplinary effort to explore the nuances of controlled carbon monoxide release in cells. Berreau and Benninghoff, along with their students Marina Popova, Tatiana Soboleva, Hector Esquer and Stacey Anderson, as well as colleague Suliman Ayad of Florida State University, are garnering international attention with their findings. The team recently published results of their studies in the American Chemical Society journal Chemical Biology and in the Journal of the American Chemical Society. The team's research is supported by the National Institutes of Health, the Utah Agricultural Experiment Station and the USU Office of Research and Graduate Studies. Releasing carbon monoxide, also known as CO, probably sounds a bit scary. After all, we equip our homes with carbon monoxide detectors to avoid tragic accidents. We take care not to idle cars in enclosed spaces. Yet, the fearsome gas is produced by our own bodies, albeit in tiny amounts, and may be a key antidote to such modern-day maladies as cancer, inflammation and hypertension. Like many substances, including the less-menacing examples of water and oxygen, too much carbon monoxide is a bad thing. But a little might be a lifesaver. "That bruise on your skin – that's evidence of a biochemical pathway, where CO is being released," says Berreau, associate vice president for research at Utah State and professor in USU's Department of Chemistry and Biochemistry. The USU scientists' specific molecules for CO release are unique, in that previous attempts to develop carbon monoxide-releasing molecules, known as "CORMs," have used metal-containing structures. "Use of metals raises concerns because of possible toxicity," Berreau says. The USU-developed molecule is derived from organic pigments called flavonoids, which occur naturally in such foods as berries and cacao. Among the challenges of developing the molecules and harnessing the healing power of CO is figuring out how to deliver the potentially beneficial gas in safe, desired amounts to specifically targeted sites in the body. "A feature of our molecules is they exhibit carbon monoxide release only when triggered by visible light," Berreau says. That's a "unique and exciting" part of USU's efforts, says Benninghoff, associate professor in USU's Department of Animal, Dairy and Veterinary Sciences and School of Veterinary Medicine. "Our flavonoid-based, organic photoCORMs are trackable, targetable and triggerable." Doctoral students Popova and Soboleva are delving into what happens at the cellular and molecular levels, as CO is released and diffuses within cells. 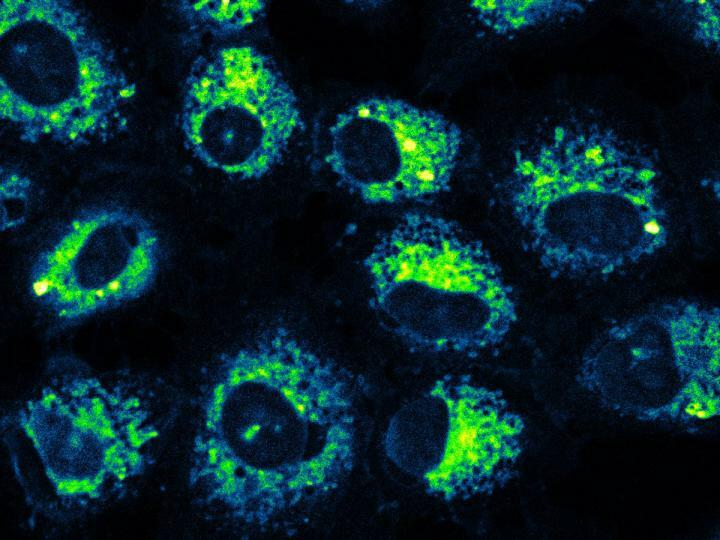 Using fluorescence microscopy, Popova, lead author of the JACS paper, is demonstrating targeted CO delivery by photoCORMs to cancer cells, as well as the ability of the photoCORMs to produce significant anti-inflammatory effects. "We're refining our molecular structure to enable better control of CO release to produce more targeted and precise biological effects," she says. Soboleva, a USU Presidential Graduate Research Fellow and lead author of the ACS Chemical Biology paper, is investigating the photoCORM's behavior at the mitochondrial level. She's a recent recipient of a competitive American Health Association Fellowship, which will enable her to further explore use of the photoCORMs to combat inflammation, a modern-day public health scourge linked to wide range of chronic diseases, include heart disease and diabetes. "Our collaboration across disciplines has enabled us to achieve far more than we could have in our own lab," says Berreau, who holds the patent on the USU-developed photoCORM. "This is why collaboration matters. We are bringing complementary expertise toward developing CO-releasing molecules for potential therapeutic applications."